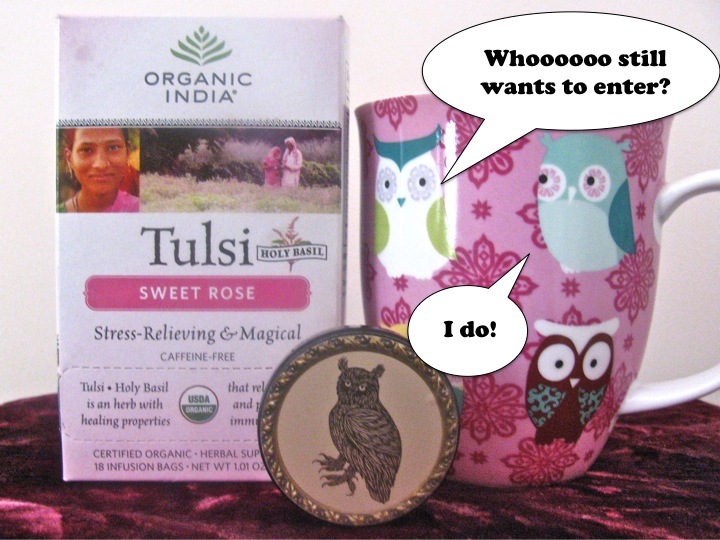 Last chance for one lucky commenter to enter for the chance to win a tea sampler including Organic India’s Tulsi Sweet Rose Tea and a small sample of Soap and Paper Factory’s Owl solid perfume, courtesy of Brie. To enter, leave a comment below or on the original post and tell us about a special mother or motherly figure in your life. This drawing will close Sunday, May 19, at midnight EST. Anyone in the US or overseas can enter. The winner will be drawn by Brie and her children from her special ceramic owl. We will announce the winner on this blog in a separate post and also make the announcement on Twitter. The winner will have one week to contact us with a mailing address. In the case that the winner does not get in touch with us, we will draw again for a runner-up. Oooh! Still a mystery 🙂 Still exciting! Will do 🙂 It’s from the owls, isn’t it? Yes! Oh, wait . . . oh no! I just remembered that I haven’t replied to her yet! I’m so sorry! The end of the semester has been too crazy! Replying now . . .
Just replied! Many apologies, dear Lucas! Grades for my students are due this week, so it has been a little overwhelming. But after they are turned in this week, I will have so much more time! Can’t wait! Lucas, I went BEYOND giggling and laughed so hard that my teenage daughters rolled their eyes and told me that I was “strange”…Daisy did a wonderful job with this one! Thank you, Brie! Btw, you’re not strange at all! As I have shared before I am a sucker for anything with slightest hint of the strigine. Therefore that pair of owls jawing away to each other had The Dandy in hoots of laughter. So pleased to have brought a little laughter to your day! I hope that it was a wonderful one.